Hospital Bed Hand Controls (product #15005HC) are used to control the bed frame movement of electric beds and is designed to work with the Full-Electric Bed (15005) and the following Bariatric Beds: (15300, 15302 and 15303). Electric Hospital Bed Hand Controls (product #15005HCN) are used with the Full-Electric Bed (15005), and the following Bariatric Beds: (15300, 15302 and 15303). Bed Hand Controls (product #15030HC) are used with the Ultra Light Plus Semi-Electric Beds (15030 and 15030N) and with Low Beds (15230 and 15235). Hospital Bed Power Cord (product #15005PC) is used with the Semi-Electric Bed (15004), Full Electric Bed (15005), and the following Bariatric Beds: (15300, 15302 and 15303). Medical Bed Foot Section Motor (product #15005MF) is an electric bed replacement motor for the foot section of the Semi-Electric Bed (15004), Full Electric Bed (15005), Long Term Care Bed (15801SD), and the Low Bed (15303SD). Full Bed Rail (product #15204) is for use with the Manual Long Term Bed (15601SD) and the Full Electric Long Term Care Bed (15801SD). The full length bed rail is used to protect patients from fall injuries. 3/4 Length Bed Rail (product #15205) is a 54 inch side rail for hospital beds and is used to protect patients from fall injuries. This bed rail is for use with the Manual Long Term Bed (15601SD) or the Full Electric Long Term Care Bed (15801SD). 1/4 Length Bed Rail (product #15206) is used for hospital and homecare beds to help protect patients from falling out of bed. 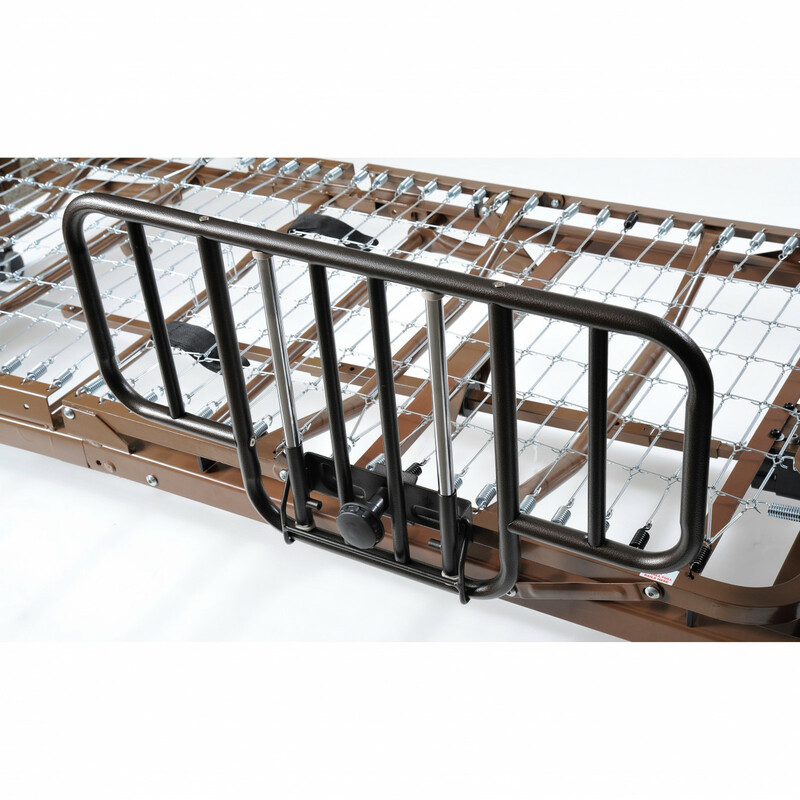 This bed rail is used with the Manual Long Term Bed (15601SD) or the Full Electric Long Term Care Bed (15801SD). 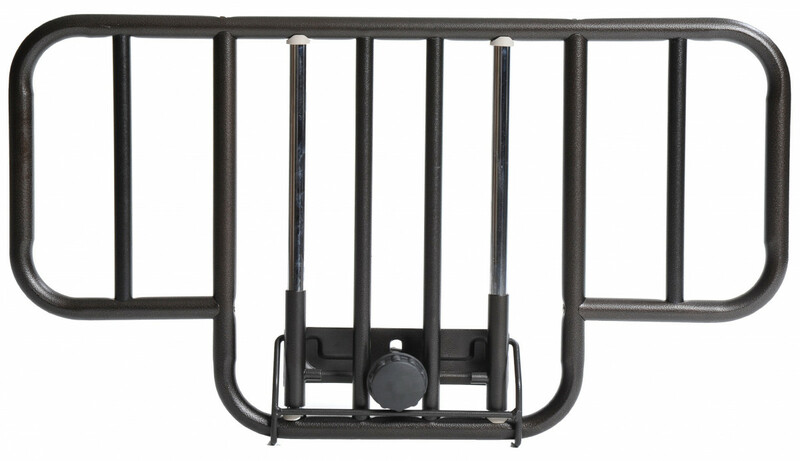 Half Length Bed Side Rail (product ID # 15201BV) like the Full Length Bed Side Rail is constructed with 1 inch steel. The half length bed rail fits most hospital beds that have a steel frame. The no-gap design helps prevent individuals in bed from lodging themselves between the side rail bars. EZ Assist Pole (product #15500) is used by ambulatory patients for assistance in standing or transferring in and out of bed. The EZ Assist Pole secures between the ceiling and floor. The Assist Pole fits ceiling heights from 93 inches to 100 inches. EZ Assist Rail (product #15500TH) is an add-on product for the EZ Assist Pole (15500) to provide additional leverage to assist patients in getting in or out of bed, chair, bathtub or toilet. The EZ Assist Rail provides additional grasping points for patients. The Assist Rail pivots and locks in multiple positions to meet the needs of individual patients. Bed Side Rail Safety Pads (product #14904) help protect patients from limb injury from contact with bed rails. These rail safety pads are designed with foam to help semi-conscious, comatose, or overdose patients from injuring their arms, legs or head against side rails of the bed. 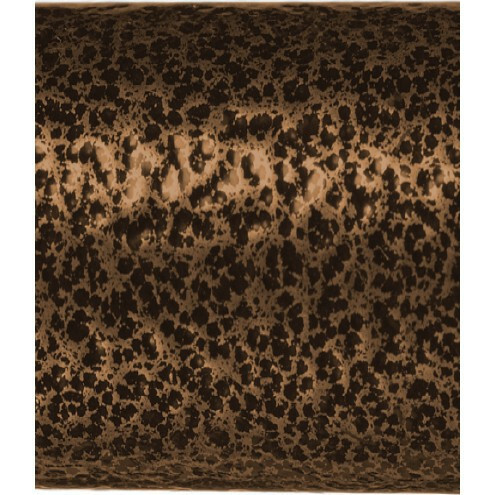 The vinyl covered foam provides for easy care and cleaning. 15005HCN - Replacement Hand Controls for Full Electric Bed 15005-15300, 15302, 15303. 15005MF - Replacement Foot Section Motor for use with 15004 Semi-Electric Bed, 15801SD Long Term Care Bed, 15803SD Low Bed and 15005 Full Electric Bed. 15018F - Replacement Foot Boards (For use with 15005 Full Electric Bed. 15201BV - Siderail Half Length No-Gap Bed Rails. 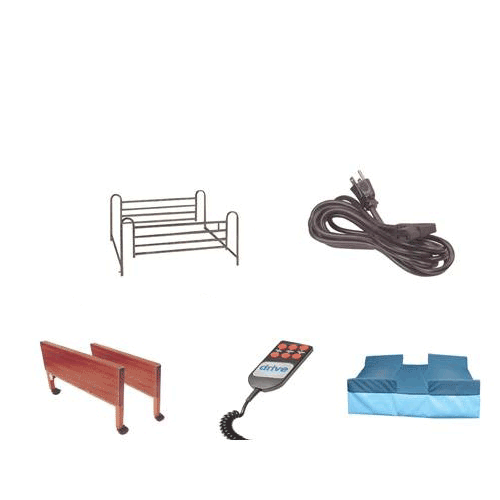 15005EXTKIT - Bed Extension Kit adds 4 inches to hospital beds, The extension kit is for use with the Drive Medical Manual Bed (15003), the Semi-Electric Bed (15004) and the Full-Electric Bed (15005). Hospital Bed Accessories and Parts manufactured by Drive Medical are used in hospitals, nursing homes and homecare to accommodate the needs of patients. Drive Medical manufacturers and distributes innovative and functional medical equipment throughout the United States. These products are designed to increase the quality of life and to promote patient independence. The summary below describes hospital bed parts and bed accessories available online at Vitality Medical! Links to additional product information are also included to help you find the right hospital bed part or bed accessory that meets your needs. We can special order the item for you if needed. Give us a call at 800-397-5899 and speak with a customer service representative who will be more than happy to help you. Excellent service. Helpful service personnel. correct product arrived promptly, in good condition. Being a hospital personnel, it is very important that quality bed accessories and parts are used to cater the needs of patients. Drive hospital bed accessories and parts offer the best products that are highly innovative, durable, and safe medical equipment. They are especially made to foster independence among patients and as well as increasing the quality of life.